Roll-N-Go® delivers solutions no other manufacturer or product line offers. It’s an economical roller docking system that delivers an excellent alternative to the huge burden and expense of traditional docks and boat lifts. Roll-n-Go systems are the perfect solution for docking on a wide variety of shorelines. Our shore docking systems are constructed with easy-glide non-marking rollers, tough zinc plated winches and a sturdy, lightweight aluminum frame secured with stainless steel hardware. Modular design makes it simple to add extension sections for use in extremely shallow water or tidal applications. 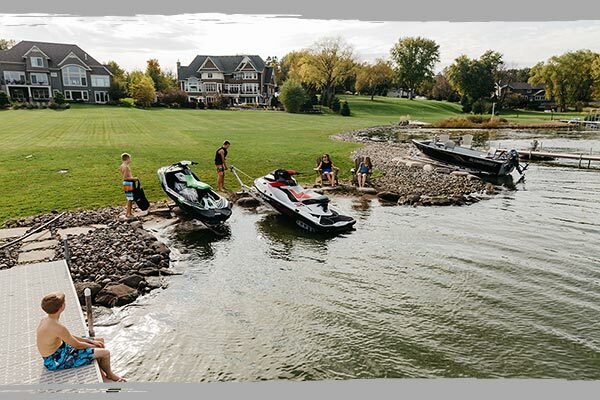 Whether you’re looking for a jet ski lift, a pontoon lift, or a boat lift, with Roll-n-Go Shore Docks, it’s easy to store boats, PWCs (jet skis) or pontoons securely, with the hull safe, protected and easy-to-access over dry ground. Check out our roller ramp docking systems below!